Some of the cookies may use a unique identifier for your session in order to enable you to move around the website, submit forms, and perform searches. This unique identifier is destroyed after 2 hours of inactivity on this site. The other cookies on this website collect anonymous information about how visitors use our website, for example, which pages visitors go to most often and if they encounter error messages on web pages. All information these cookies collect is anonymous. It is only used to improve how the website works. Aftertreatment systems are a critical component to ensure emissions from engines and power generation equipment comply with environmental standards. 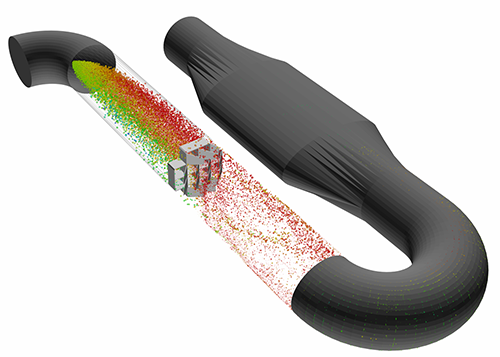 CFD simulations can be used as part of a rapid prototyping process to design systems that reduce NOx, CO, and particulate matter emissions with minimal efficiency and maintenance costs. Two of the main challenges in aftertreatment system design are maximizing the uniformity of flows upstream of catalysts and eliminating areas at risk for urea deposition. CONVERGE can predict both. And, because it eliminates user meshing and incorporates Adaptive Mesh Refinement (AMR), CONVERGE quickly produces results that are consistent across runs. 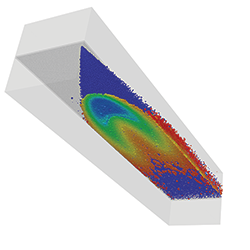 CONVERGE has the ability to run transient simulations at high simulation speeds and quickly predict the uniformity of NH3, HNCO, and velocity upstream of catalysts. In CONVERGE, it is straightforward to change the mixer locations or pipe configurations without re-meshing. CONVERGE offers both of the commonly used urea decomposition approaches—molten-solid and multi-component—so that you have the flexibility to choose the appropriate option for your situation. You can quickly prepare plots of the NH3 uniformity index and conversion efficiency for single- and multiple-channel, multiple-catalyst systems. 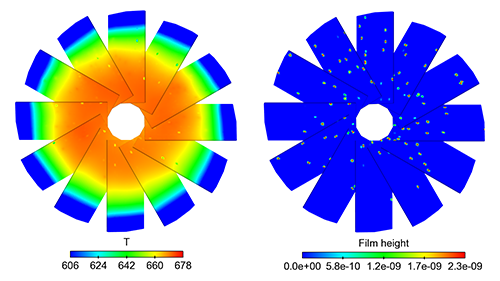 Pulsed sprays and transient films can use time-averaging to identify average non-uniformities that can be imported to a surface chemistry tool such as GT-SUITE. CONVERGE can be coupled with 1D surface chemistry tools such as GT-SUITE, Axisuite, or internally developed tools for complex chemistry analysis inside the SCR catalyst brick. After CONVERGE develops the results of flow non-uniformities at the inlet of the SCR, these results are imported into surface chemistry tools for detailed NOx reduction and NH3 slip analysis. Identifying where and when urea deposits will occur requires accurate modeling of the spray-wall interaction, filming and wall cooling to indicate which films are at risk for urea deposit formation. CONVERGE can model the full atomization process including spray evaporation and wall interactions with accurate wall temperatures. CONVERGE contains fully validated atomization models—including breakup, collision, and coalescence models—for injecting sprays defined by droplet size, size distribution, and velocity. Film transport models include splashing, filming, stripping, and separation from a surface. An effective Urea/SCR model must account for the temperature of the surface, which depends on heat transfer from the exhaust gas, urea-water spray, and the heat loss to the surroundings. CONVERGE’s conjugate heat transfer (CHT) model can incorporate the accurate wall temperatures required for splashing and film evaporation models to identify areas that could cause wall deposition. CONVERGE’s CHT model also offers super-cycling, which can quickly achieve a statistically steady metal temperature without scaling the metal heat capacity. This feature is especially helpful in pulsed spray applications in which metal temperatures will stabilize within a couple of spray pulses rather than in seconds. Urea deposits are the primary concern of most engine aftertreatment designers. Thanks to its robust spray, splash, film, CHT and urea decomposition models, CONVERGE can identify films that are at risk for urea deposits. Furthermore, Convergent Science and IFPEN are collaborating to implement new urea deposit models in CONVERGE. Whether you need fast turnaround uniformity data or accurate urea deposit risk assessment, or if you’re simply considering what CFD could do for your designs, CONVERGE provides fast CFD and accurate models to support your aftertreatment design needs. Lee, K.S., “CONVERGE GT-SUITE Coupling Analysis for Denox System on SCR Catalyst,” IDAJ CAE Solution Conference, Seoul, Korea, Nov 21, 2016. Sun, Y., Daya, R., and Verhnam, B., “Urea Deposit Prediction in the After-Treatment System,” CONVERGE User Conference, Madison, WI, United States, Sept 27-28, 2016. Quan, S., Wang, M., Drennan, S., Strodtbeck, J., Dahale, A., “A Molten Solid Approach for Simulating Urea-Water Solution Droplet Depletion,” Institute for Liquid Atomization and Spray Systems-Americas, Raleigh, NC, United States, May 17-20, 2015. For more CONVERGE papers, please check out the bibliography (PDF). Learn more about how CONVERGE helps you quickly and accurately solve your CFD problems. Convergent Science is an innovative, rapidly expanding computational fluid dynamics (CFD) company. Our flagship product, CONVERGE, is a revolutionary CFD software with truly autonomous meshing capabilities that eliminate the grid generation bottleneck from the simulation process. Convergent Science is headquartered in Madison, Wisconsin, and has offices in the United States, Europe, and India and distributors worldwide.